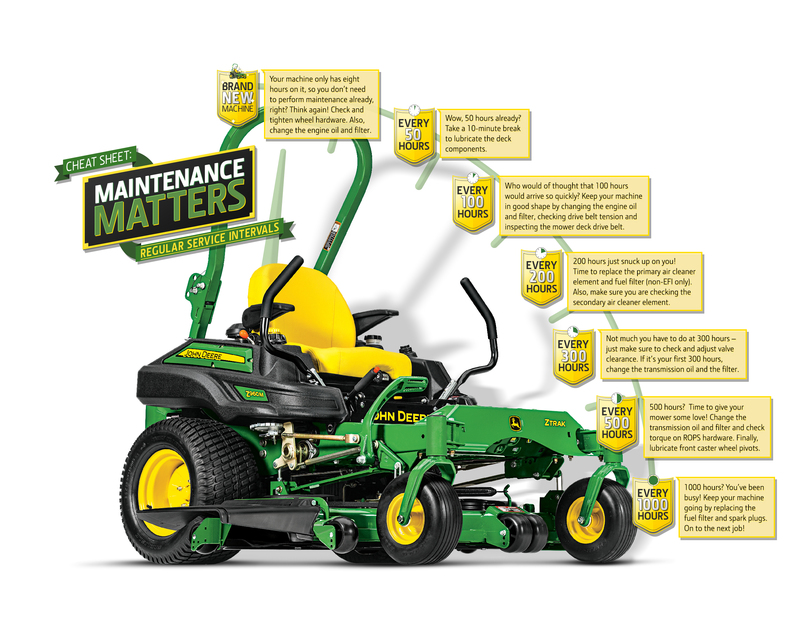 With landscape professionals on the cusp of summer, John Deere offered a refresher on how to keep tabs on key mower service intervals. The breakdown, per hour intervals, is as follows. Zero hours (brand new machine): Check and tighten wheel hardware. Also, change the engine oil and filter. Every 50 hours: Take a 10-minute break to ensure your machine stays fresh by lubricating the deck components. Every 100 hours: Change the engine oil and filter, checking drive belt tension and inspecting the mower deck drive belt. Every 200 hours: Replace primary air cleaner element and fuel filter (non-EFI only). Also, make sure you are checking the secondary air cleaner element. Every 300 hour: Check and adjust valve clearance. Every 500 hours: Change the transmission oil and filter, and check torque on ROPS hardware. Finally, lubricate front caster wheel pivots. Every 1,000 Hours: Replace fuel filter and spark plugs.